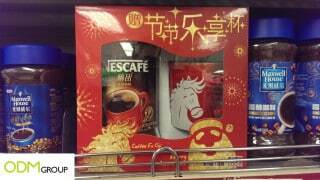 Nescafe is trying to boost sales in China by using different kinds of promotional package. We spotted these 2 gift packages at Jusco in Zhuhai. Nescafe is trying to increase their sales in China by selling their coffee in these luxury packages. The first package consist of a jar filed with their famous coffee, a promotional mug with their logo clearly printed on both sides and also a coffee creamer from one of their Chinese brands. 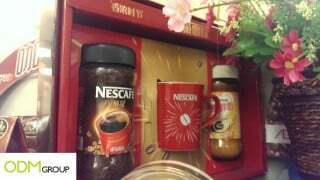 The second package contains Nescafe’s coffee and a different promotional mug. These two promotional packages have an impact on the consumer on the short-term as well as on the long-term. For the short-term it can be said that the consumer will buy it because of the package and use it as a present for family or friends. On the long-term the mug will remind the consumer about the great coffee of Nescafe. Combining a promotional package with a gift is a great way to boost sales. For the short-term consumers will remember your brand because of the attractive packaging and on the long-term consumer will remember you because of the gift they got with it. When considering a promotional campaign, where the promotional gift will be given away to consumers is important (directly or via a retailer) as this dictates the package around it. The promotional package will certainly increase the brand value for the consumer. Also adjust the package to the gift, as you can see on the pictures of the Nescafe package the horse from the mug is also on the front on the package. This will help to convey your message to the consumer. If you are interested in promotional package and gifts, please do not hesitate to contact us or our sister-company Mindsparkz for a personalized package.